Cape Town – Proteas debutant Stiaan van Zyl desperately seldom bats outside of a top five. 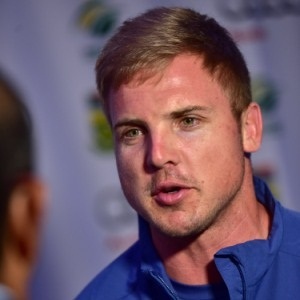 So there seemed certain pluses to the initially very strong likelihood that, from his designated role at No 6 in the South African side, he would get to the crease pretty quickly anyway at Centurion on Wednesday. With the world’s No 1-ranked side losing their first three wickets all with the total on 57 on day one of the first Test against West Indies, the left-hander from the Cape Cobras presumably had to scramble his pads on in a hurry. But that was about as industrious as he had to get all day, as he instead sat, partially wearing the cumbersome paraphernalia of batsmanship, for some 75 overs watching a masterclass from established superstars Hashim Amla and AB de Villiers, wholly transforming the Proteas’ once tenuous fate as they reached a giddy 340 for three at stumps. Thanks to the pure class and respective unbeaten centuries of De Villiers, ranked second among the planet’s Test batsmen, and the sixth-placed Amla, South African can seriously think 500-550 as a likely first-knock posting, after jittery moments on the damp and heavily overcast first morning when 250 perhaps seemed a reasonable aspiration at times. Instead the West Indies experienced the old “London bus syndrome” after winning an inviting toss: three wickets in the space of 15 balls but then fruitless, damaging hours of inactivity in the wickets column. The good news for the long dormant Van Zyl – an unenviable situation when you are making your maiden appearance for your country – is that on Thursday he will effectively bat at No 3, his favoured berth for his franchise, as he will take guard at first drop on the day. He is probably the reasonably patient type anyway, given that he has waited until the age of 27 and diligent accumulation of more than 6,000 first-class runs to get to this first Test cap. Van Zyl could also benefit from the absence or restricted service of Kemar Roach, the Caribbean tourists’ most threatening bowler, as he reportedly suffered some ankle ligament damage and was unable to complete his 16th over: whether the remaining front-line attack of Messrs Taylor, Cottrell and Benn is capable of completing a 20-wickets job at SuperSport Park is quite doubtful on early evidence. But before we get to see the new guy stride to the crease, there is the hardly inconsequential matter of West Indies trying to separate the blazing De Villiers-Amla alliance. It is already worth 283 runs, a South African record for the fourth wicket, and if they successfully negotiate the first hour or so of a new ball on the second morning, thoughts will inevitably begin to turn excitedly to the possibility of their eclipsing the SA landmark for any wicket of 429 achieved by Jacques Rudolph and Boeta Dippenaar against Bangladesh at Chittagong in 2003. The pair have simply underlined, as if it was even necessary, just how sublime they can be in full flight, and even if they had their slices of luck along the way – most notably when Amla’s off-stump was brushed by a Roach delivery without the bail dislodging when the bearded accumulator had only 25 – conditions stayed resolutely challenging as they went about their business. It helped that the Windies’ seamers sent down far too many Christmas gift half-trackers or leg-stump half-volleys, which served as welcome pressure relievers, and when South Africa eventually get their turn to bowl, it will be a surprise if their all-pace attack – Kyle Abbott has been infused for additional venom at a ground where he already sports one-innings figures of 7/29 against Pakistan – is nearly as generous for freebies. Was the visiting attack simply short of a gallop, after playing only one rain-curtailed warm-up match on these shores ahead of the opening Test? Neutrals will hope so, because otherwise they seem destined for a fair old bruising from the Proteas’ battery of stroke-players over the next three weeks. One area of concern for SA enthusiasts will be the absence of a recognised spinner in the home ranks for later in the match; there was turn and bounce on occasion for the lofty Sulieman Benn on Wednesday.